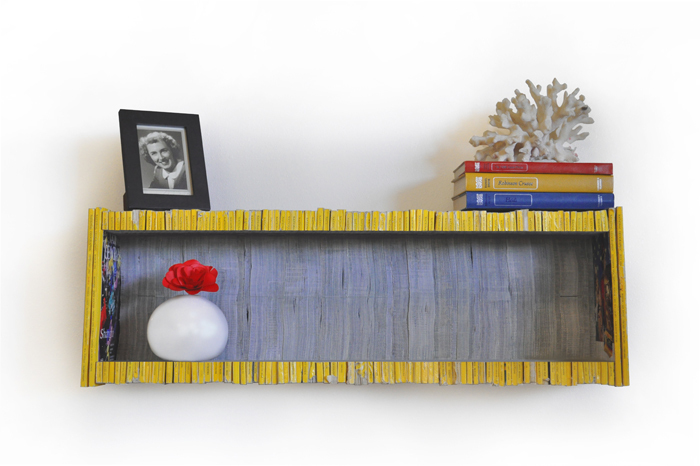 Seattle-based artist Sean Miller made this bookshelf out of a stack of old issues of National Geographic. I'd do the same with my old issues of Poets & Writers or the Writers' Chronicle, 'cept I'm not that artsy and I don't have that much time . . . but I DO need to commence with spring cleaning. Among many of my big rituals is the cleaning of the desk. I'd show you a photo of my desk, but I'm too embarassed. And frankly, I haven't been able to work at my desk since child #2. So my desk has become a way-station for scrap paper. Additionally, I have two big boxes of manuscripts from a contest I helped screen.On top of that, I've got books stacked here and there in no particular order. I've got work to do. And I need to do the work if I'm going to write this summer. If you followed my old blog, you know that I'm a binge writer and I like to write in a single sustained stretch. This year I'm going to try to retrain myself to write a little more diligently--perhaps once a week or perhaps every-other day. But something's got to change because I don't think I can wrangle a whole sustained month of writing without drastic interruptions. Anyway, that's my messy life, and I can't afford a messy office. And really, how can you write when you've got bits of kibble in the carpet? Honestly, how can you live with yourself, knowing that you won't be able to stroll about the house, barefoot with a mug of coffee in the wee hours of the morning without breaking the skin of your foot on some pebble or some pine-needle you've tracked in from the yard. Yes, I have to vacuum the house. The whole house. I know you're thinking that these pre-writing rituals are getting to be ridiculous, but I'm quite serious about them. I have to do all of these housekeeping tasks in order to keep me at task when I'm at the desk. I don't need to explain why the bathrooms need to be cleaned. They just do. This was a lot easier when I lived on a smaller property. Now, however, I live on a plot with acreage, so it's become quite difficult to sustaine #5 on the must-do pre-writing rituals. At the very least, I mow my lawn and sweep my carport. A large pot of it at that. I usually start my writing ritual with a bit of reading and sometimes I get drowsy during my reading sessions. The caffeine need is a constant. I need coffee even when I'm not writing. 7) Make a to-do list and put "write poem" as the top item on the list. Honestly, I do this. It's comical, but I have to put it on a daily list so that I can cross it off at the end of the day. I was in a panel with Daniel Alarcón a couple of years back and he mentioned a writer who had rented a second apartment room one flight down in his same apartment building. He would dress up in a suit and tie like he was going to work every day, five days a week, descend the elevator one flight to the second apartment room, and proceed to write all day in that apartment. So putting "write poem" at the top of my list is my simpler writing ritual. 8) Pay the bills and balance the check books. I don't believe in being a poor and starving writer. That's been done before and I'm trying to omit as many clichés in my writing and in my life. So what's the big deal with all the cleaning and whatnot? The way I see it--I'm trying to get all the excuses out of my day. It's easy enough to make all of the above an excuse, but I won't get the poem on the page if I commit to these excuses. I try to head 'em off before they start to bother my psyche. Does this work? Well yes. For me it works fine. I'm sure it'd drive other people mad. Oh, and it doesn't hurt to have babysitting or a spouse who is absolutely understanding. So, shout-out to Meredith for being an awesome mother and a patient partner. The portfolios are coming in steadily. Soon I'll be grading.